All self-storage owners will be sellers some day, whether they want to or not. 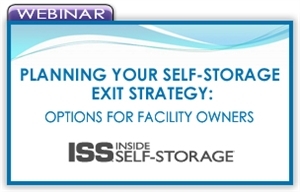 Whether you’re new to the industry, already an owner or actively planning to sell your storage business, this presentation will teach you some approaches to planning your exit strategy, including when to divest yourself from the asset, determining when to sell, and considerations for passing the business to an heir. Planning your exit strategy involves more than getting a good price. How you prepare will affect your sale price, lifestyle, family and retirement.